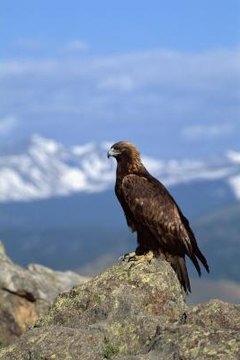 Hawks and falcons are raptors, or birds of prey. They are both skilled hunters, but go about their hunting activity in different ways. Their differences in size, color patterns and diets also set the two apart. All falcons belong to the same genus -- the taxonomic category above species and below family -- while hawks fall under several genera. Falcons have long wings, and they fly at high speeds. In fact, the peregrine falcon is the fastest moving bird on record, flying around 60 miles per hour and diving up to 200 mph. Hawks' wings are shorter than falcons', and they move much more slowly in the air. Hawks are also larger than falcons. Depending on the species, color variations can help determine whether you're seeing a hawk or falcon. Red-tailed hawks, for example, have white chests and brown spots on their heads, wings, backs and abdomens. Only adults have the namesake red tails; juveniles have brown, striped tails. Peregrine falcons have white chests like hawks, but their coloring is generally gray and white, and includes horizontal stripes on their abdomens and legs. Falcons have gray "sideburns" called malar stripes, while red-tailed hawks don't. Falcons use their powerful beaks to grab and stab prey, sometimes in the midst of a dive. Hawks use their claws, known as talons, to kill their prey. Hawks' beaks have a slight curve to them, while falcons' beaks have a notch on them. Hawks' shorter wings allow them to move through shrubbery and trees in pursuit of prey. Falcons' longer appendages prevent them from moving efficiently this way; they thrive in open space. Both hawks and falcons are carnivores, so they eat a variety of animals. Falcons, with their midair skills, tend to eat birds and other flying critters. While hunting, they often fly above and behind their prey, then dive onto it with their beaks. Or, they may stun the prey with a foot, then fly underneath to grab it as it falls. Some hawks feed on birds, but many sneak up on and grab ground-dwelling prey like mice, rats, rabbits and squirrels. Outside My Window: Falcon or Hawk?